Kids Agree: They Love Kidtricity! Get ready for the most fun you have ever had learning about the Bible! Get ready for Kidtricity! Kidtricity is our completely unique and absolutely incredible children’s Sunday program that teaches the Word of God in a whole new way! This supercharged hour of Sunday fun is filled with puppets, skits, music and nonstop laughter! 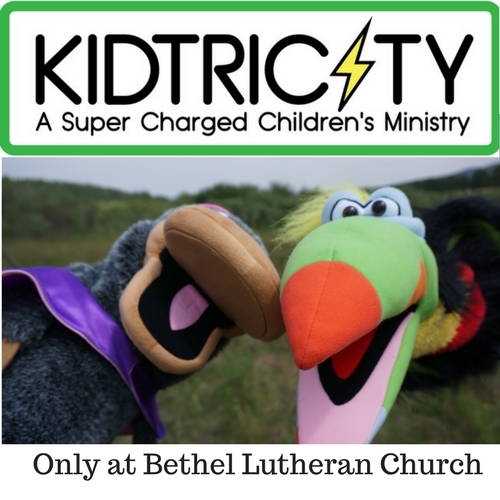 Kidtricity meets on Sundays at 9:15 am during the school year in The Christ Center. This year’s Kidtricity theme is Kidtricity Down Under! Be ready for some wild Australian inspired Bible fun! There is no cost to attend! Register today by clicking the button below! Kidtricity begins on September 9th! There is also a great coffee time for parents at Kidtricity! We have Keurig machines with an assortment of coffee, tea and other beverages. At Bethel we love our kids and see them as an important part of our church! We strive to provide programs, events and services that capture the attention of today’s kids and share the love of God in memorable ways that are engaging for all ages! Please contact Pastor Dave Nickodemus (pastordave@bethellutheran.net) with any questions regarding Children’s Ministry.